The Radio Astronomy Association Switzerland (RAAS) is a working group of the Swiss Astronomical Society. The members are engaged in the detection and the recording of electromagnetic radiation from celestial bodies, objects and from outer space. Join our group! New observers are welcome at any time! Please visit also our forum "SAG Fachgruppe Radioastronomie". April 20, 2019: The station SWISS-MUHEN recorded the first burst of type 6. April 14, 2019: New station: The observing station VALLENSIS is located in Brig and is operated by Robert Glaisen. 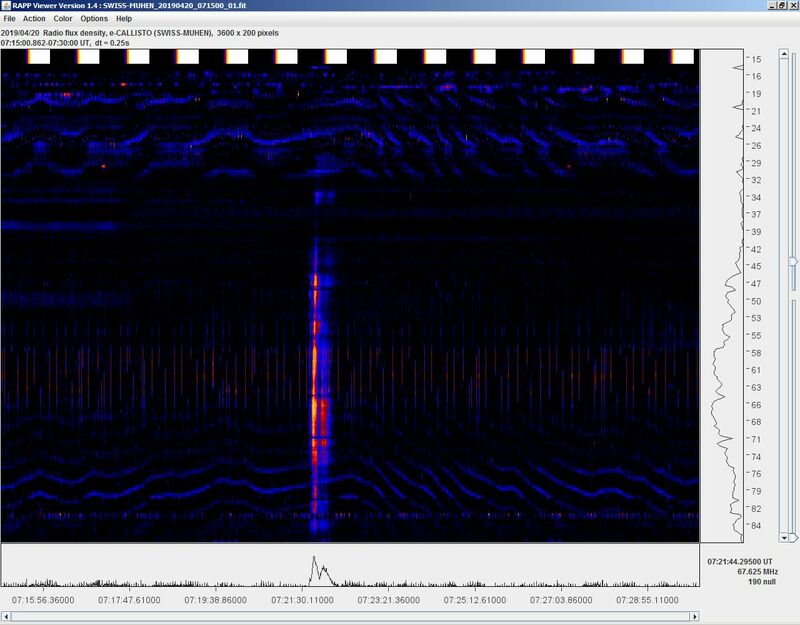 The equipment is designed for the recording of Sudden Ionospheric Disturbances (SID). 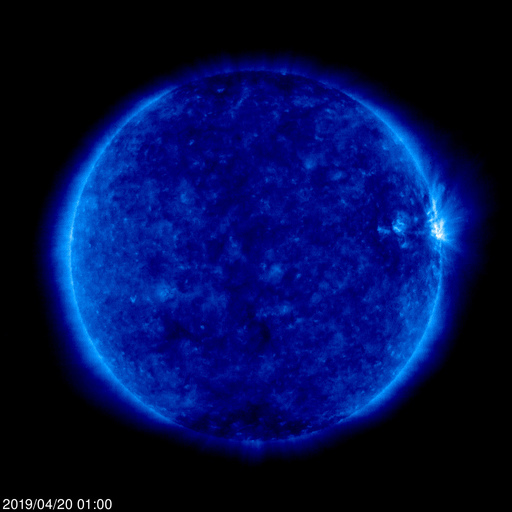 March 9, 2019: The station SWISS-MUHEN recorded the first burst of type 2. 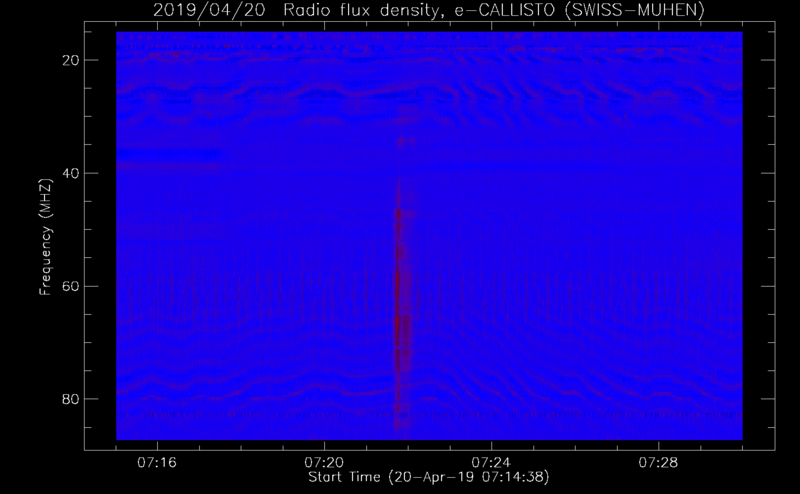 Jan. 29, 2019: The station SWISS-MUHEN recorded the first burst of type 1. Sept. 29, 2018: New location: The antenna and the electronic components of the station swiss-muhen were moved to their definitive position: On the roof of the car port. 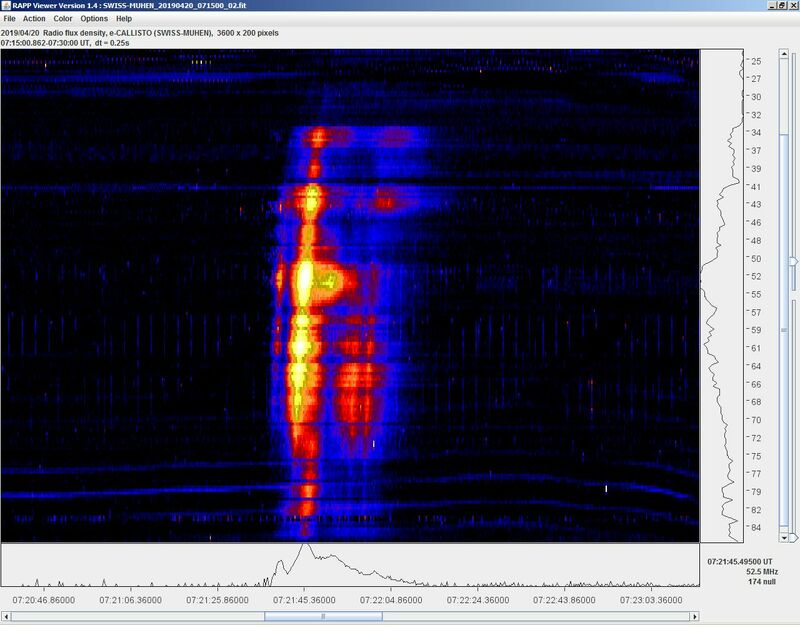 The situation concerning the receive of noisy signals remained mostly unchanged, according the screenshot of the two polarizations Callisto 01 (upper part) and Callisto 02 (lower part). The station runs stable. 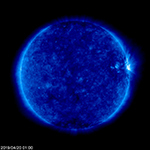 As a result of the currently very low activity of the sun, there are no bursts expected for the moment. Aug. 9, 2018: The station SWISS-MUHEN recorded the first burst of type 3. Aug. 5, 2018: New link: The website SolarMonitor shows a complete overview of the activity of the Sun. The monitor contains the current data from numerous instruments (SDO, HMI, GHN, SWAP, AIA, XRT) as well as onto the far side of the Sun. Additional diagrams for the fluxes of protons, electrons, x-rays, plasma and B-field (GOES, ACE) complete the activity overview. Beside of this, the monitor allows the view back in history as well as near predictions. Very useful! July 17, 2018: The Solar Radio Spectrometer of Peter Hirt was connected to the international e-Callisto Network. The station is called SWISS-MUHEN and delivers the data directly to the network server of FHNW. Introduction and Equipment of the new station. Oct. 8, 2017: "3 - 2 - 1 - lift off" for the new working group! Let's listen to the sky!